June 20 is World Refugee Day! Having created so many refugees, perhaps now we can help create some semblance of a shelter for them until such time that they can go back home. 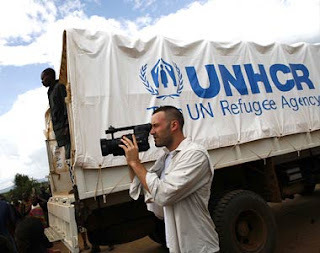 Join UNHCR and Ben Affleck to help displaced fellow beings! "There are millions around the world in need of shelter, not just physical shelter but respect for their rights and the capacity to live in safety and dignity. In recognition of World Refugee Day, Microsoft has offered to match every donation you make for the next two months. If you donate $10, Microsoft will donate $10. Every donation you and your friends make for the next two months helps our work twice as much. We also know many of you would like to help but cannot afford to donate. Therefore, Microsoft have offered to donate $1 for every person you persuade to join our cause. Use the invite button below of this page to invite your friends to join. Regardless of your location or position, you are just a few clicks away from raising hundreds, perhaps thousands, of dollars." People live in pure hell, and nobody in the first word seems to care. How much time do you spend thinking about the refugees in your week? Your question made me think, and I surprised myself; I don't think of refugees as often as I'd like to, but everytime I watch/read the news I am compelled to think about those that don't have a place to call home which includes displaced people all over the world. Their displacement may be due to varied reasons, but their reality is the same - one of hom(p)elessness. Besides, I may be a refugee of sorts myself, in which case I may be living this reality!